Is a Far-Right Wave Building in Latin America, Beginning in Brazil? Presidential frontrunner Jair Bolsonaro leaves a polling station in Rio de Janeiro, Brazil, Oct. 7, 2018 (AP photo by Leo Correa). 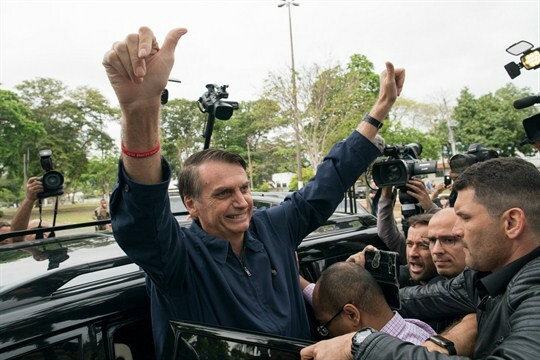 Ahead of Brazil’s elections last Sunday, the far-right presidential candidate Jair Bolsonaro was widely expected to finish first in a crowded field. With more than a dozen people running for the presidency, however, few thought he would come as close as he did to winning an outright majority in the first round.